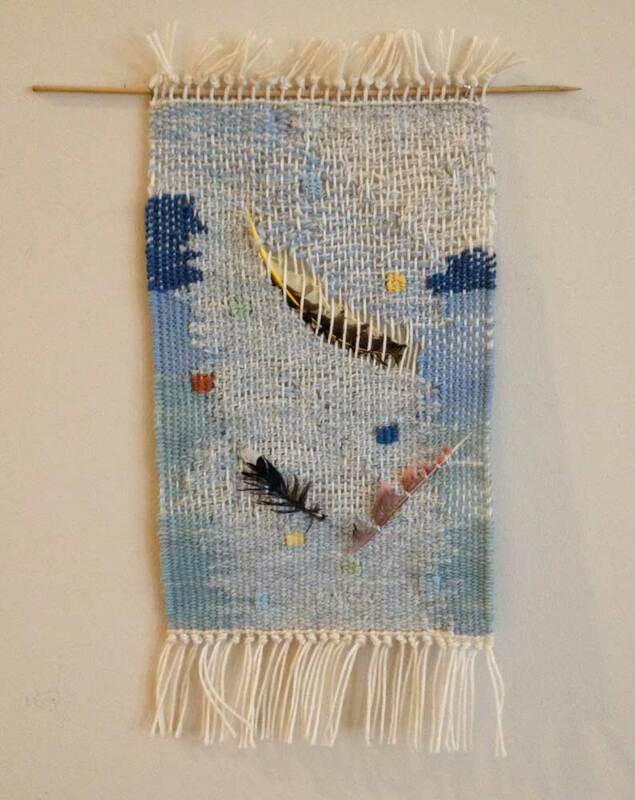 I had the idea I wanted to insert actual feathers into a small tapestry. I had stumbled across an envelope with three feathers, one red, one blue, and one yellow and black, that I had saved who knows when, a long time ago. I thought it would be a simple matter just to insert them in a shed and weave around them. It seemed important to do this improvisationally, without a cartoon or samples, in the spirit of the collages I've been doing lately. A couple other artists' work was in the back--or maybe the front--of my mind. Tommye Scanlin's large tapestry of larger than life feathers, recently on view in her show at Berry College, made a powerful impact on me. And I've been looking lately at the work of Lenore Tawney, that giant of fiber art, who frequently used feathers in her weavings and collages. Early composition idea. Frame is resting on a black table. Well. Turns out that it's not as easy as it looks. The small feathers just didn't want to stay put in my 8 epi warp. 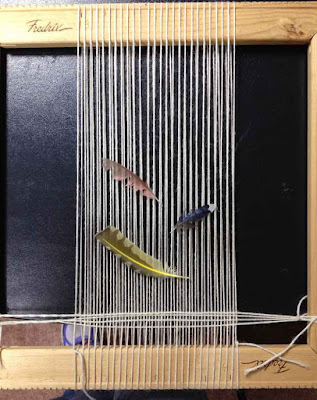 I ended up stitching the two small ones in place with tiny tacking stitches, but that made the fine filaments of the feathers stick together in clumps. Not great, but nothing I could do about it. I told myself it was OK and plowed ahead, in the spirit of experimentation. 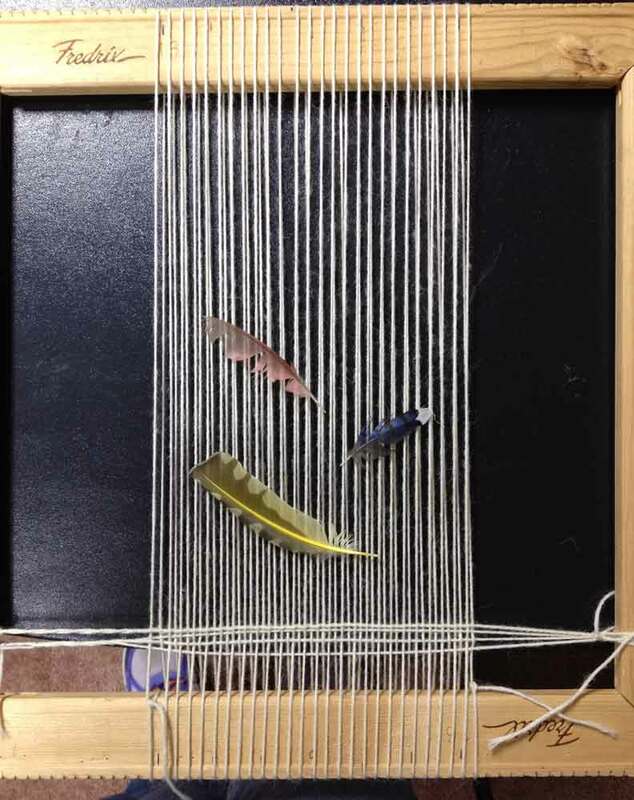 The last feather, the large black and yellow one, was easy to insert and I got it to stay more or less in place while I wove a rather open weave around it. 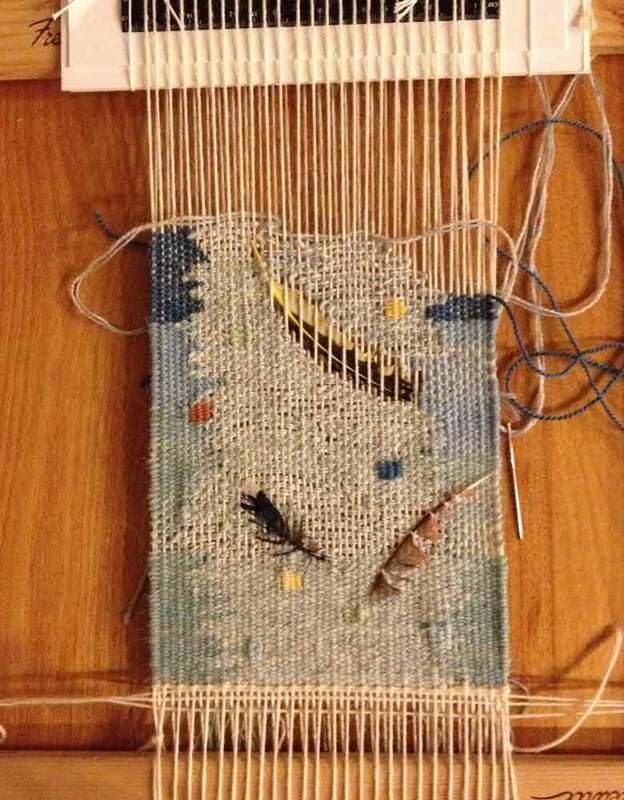 In fact I really enjoyed transitioning back and forth between traditional weft-faced weaving at the bottom and a more open web that allowed the warp to show and gave a more airy effect. Note to self: explore this further. Again, Lenore Tawney and others were here first. 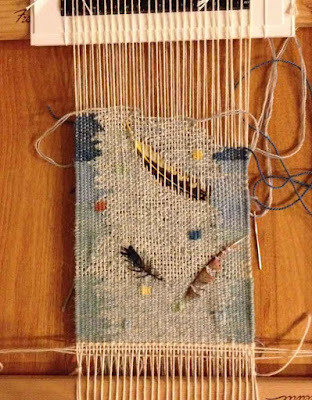 Weaving in progress. You can see I changed the position of the feathers. It looked rather good, so I flipped the frame over to finish the back. Since it's a small piece, only about 10" by 6", I thought I'd weave the weft tails back in and finish the warps by knotting fringe. Somewhere in that process I dislodged the yellow feather, and had to reinsert it. It looks OK, but not as good as it did the first time. I'm telling myself I like the open warps at the bottom of the feather and the way the yellow spine sticks out at the top. It's not exactly what I expected, but I learned a lot, and I think it has a certain kind of quirky charm. Have you done any experimental work lately? How did it go? 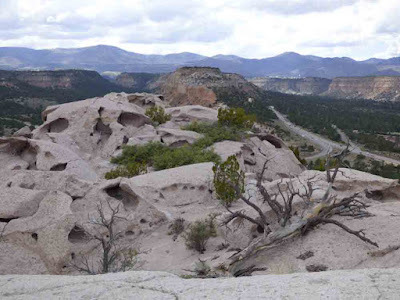 Last week we did one of my favorite things: hike in northern New Mexico. 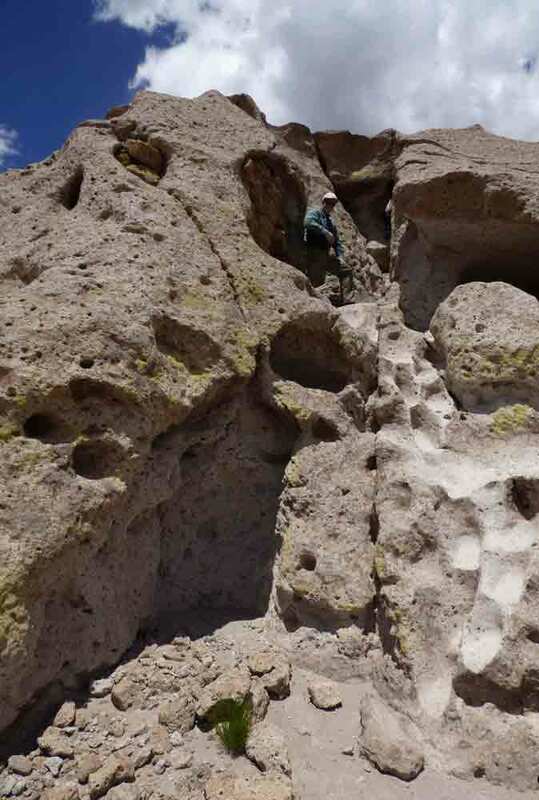 Our friend, longtime New Mexico resident and gifted photographer, Kent Bowser, has led us on so many cool hikes. This time he found one that hit all the high points as far as I'm concerned: ruins, petroglyphs, ancient Puebloan pottery shards, stupendous views, and eerie rock formations. All in under 3 miles! 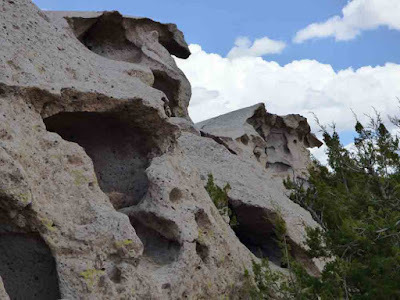 This place, the North Mesa of the Tsankawi section of Bandelier National Monument, is just outside Los Alamos, not far from Santa Fe. The ruins are in two layers. Kent told us that these walls are what remains of a school for pottery making, established in the early 20th century to revive the art of pottery among local Native Americans in hopes of generating sales and income. 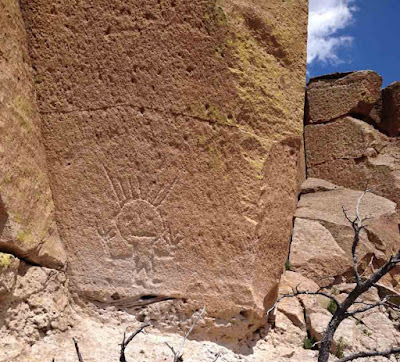 The school was constructed on the site of an ancient Puebloan settlement whose foundations are still visible. All through the area we saw pottery shards. For me part of the fun of pottery shards is learning to recognize them in among the grasses and pebbles on the ground. It's illegal to take them home, and they shouldn't even be moved, but there's no law against photographing them in situ. I love the fragmentary patterns. Before he was sanitized and used to sell t-shirts and decorate hotel lobbies throughout the southwest, Kokopelli was a fertility symbol. 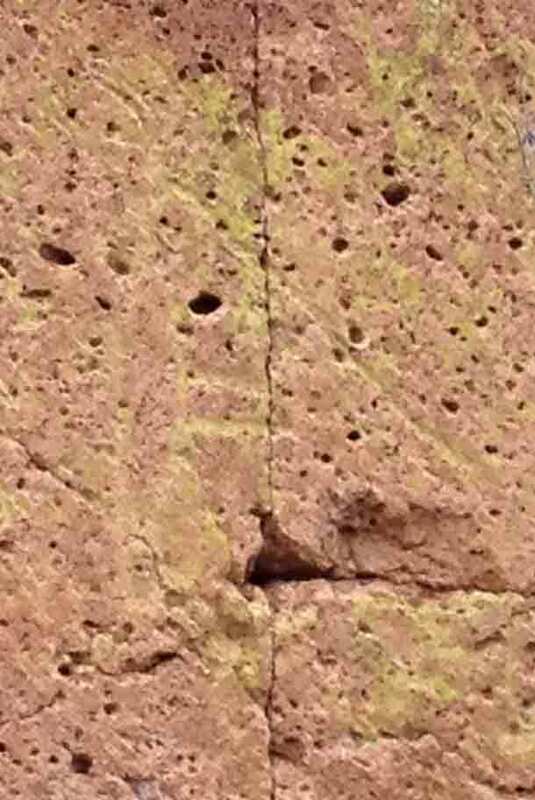 In the petroglyph below, his flute is a long diagonal line extending from the top of his head, and his "grande burrito" extends horizontally below, across the vertical crack in the rock. He does have the familiar stance and the long strands standing straight up from his head. 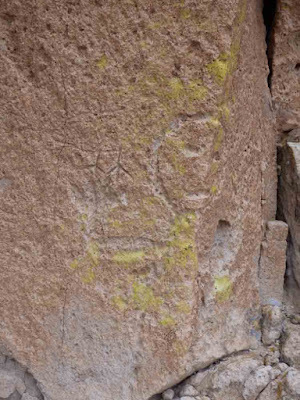 Two other petroglyphs depicting humans tied for my favorite on this hike. The first was this one. I love the way he wraps around the sharp 90-degree edge of this boulder, splitting his face exactly down the middle. His placement just seems witty to me. The second one I liked was this one, whom I nicknamed Calvin for his resemblance to the kid in the comic strip. I sat for a long time gazing at him, wondering what he was warning against, or reacting in horror to, or perhaps threatening to do. I haven't seen anyone exactly like him in any other petroglyph panels. This soft rock was so full of natural shelters and so easy to carve out that the original inhabitants used it for cavate dwellings. 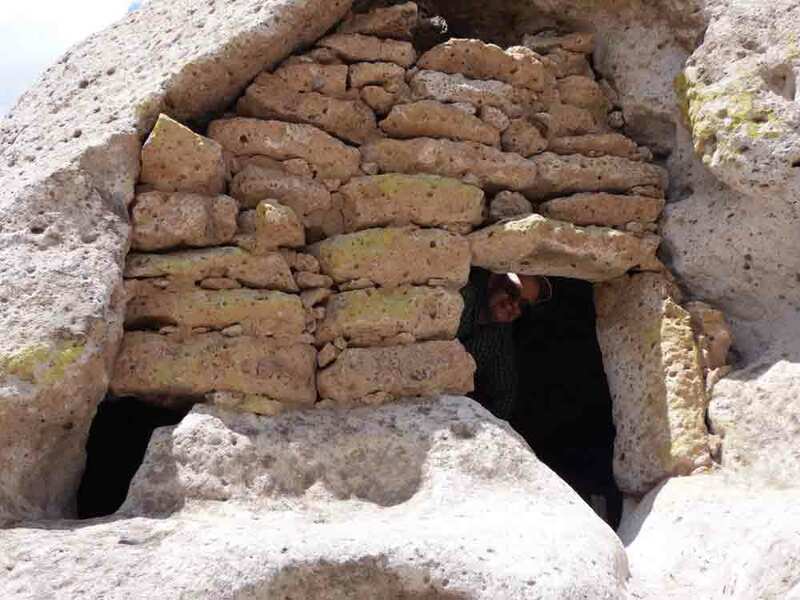 Natives scooped out larger caves, reinforced them with stone and mortar walls, and plastered the insides. Here's husband Sam peeking out of one that still has its brick walls more or less intact. And pulling back, here's a view of the steps carved into the rock leading up to the dwelling. 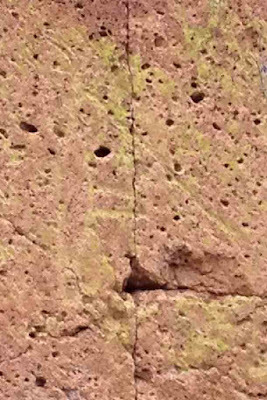 See the divots in the white rock on the right side of the photo? 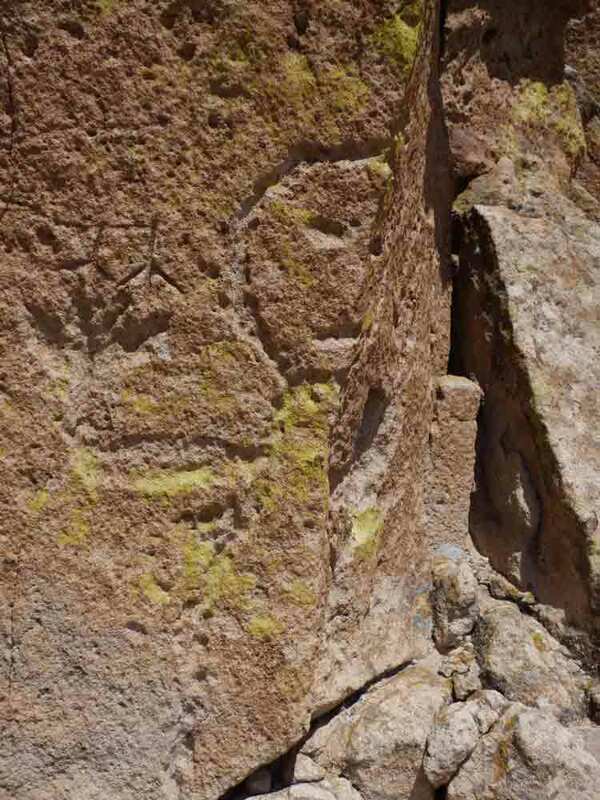 On hikes like these I love that I can get a glimpse of how people centuries before me crafted objects and homes, and how they responded to their world with representational and symbolic drawings, Much remains mysterious and scholars disagree about the meaning of most petroglyphs. But I do feel a small kinship with these earlier artists and love it when I encounter their work up close. Needless to say, this place is quite special. 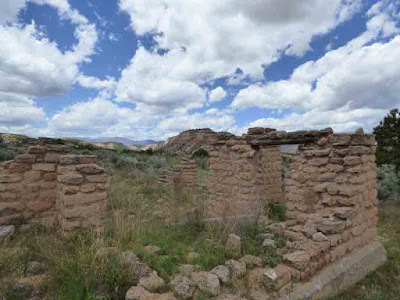 It is revered by the original inhabitants' descendants who live nearby at San Ildefonso Pueblo. And this place in particular is remarkable for its comparatively undisturbed preservation. 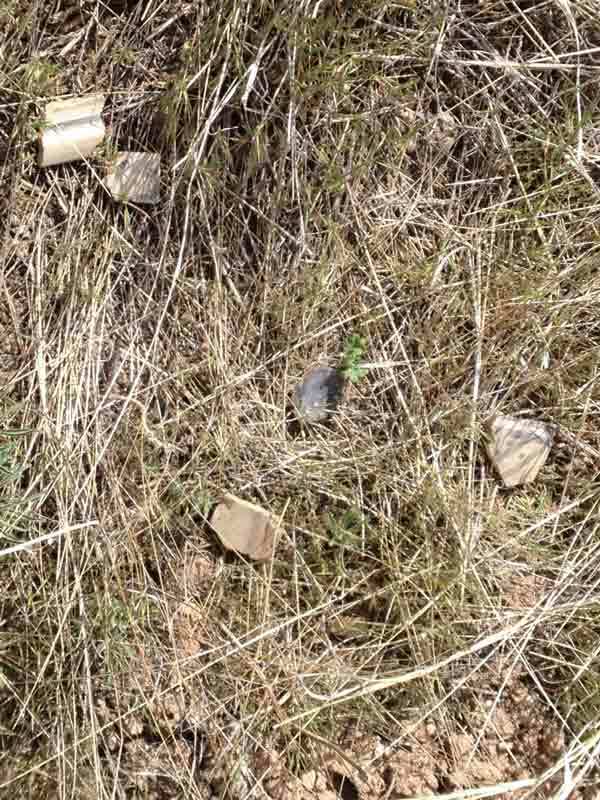 We were careful to leave no trace and not to move or damage anything. 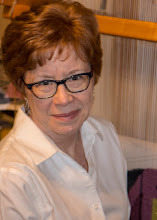 I am thrilled to be participating in this show of Georgia fiber artists at the Johns Creek Arts Center. And doubly thrilled that they chose my tapestry Mary (a sword shall pierce) as one of the publicity images for the show. I am extremely disappointed that the complexities of life mean that I will miss the opening reception. However, f you want to meet the artists and see the show, there is a second opportunity. There will be a Lunch and Learn event on Weds. May 18, 12:30-2:30. Click HERE for more details and to register. 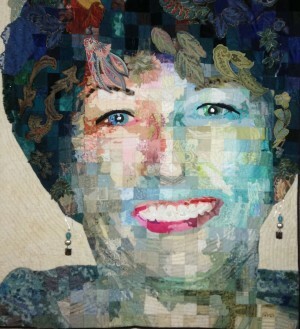 This quilt, Life's Journey by Devon Pfeif, is another piece in the show. I hope to see you at lunch on May 18 and I urge you to make time to see what promises to be a fascinating show.